If you’ve noticed the silence around here recently, you may know that we were without power for a bit in the wake of Hurricane Sandy. (I am grateful that we are all safe- my heart goes out to all those impacted). Pom-pom Play: We struck gold with my huge bag of pom-poms. Sort them, blow them across tables with straws, throw them around, create animals with them…there are endless ideas! Indoor obstacle course: To stay active, we created several obstacle courses. A favorite one was to do one forward roll, jump on a pillow, give me 2 high-fives, and then hop back. Mailbox: I got out our toy mailbox, and we wrote letters on post-it notes, and mailed them to each other. Both boys loved “writing” notes (mostly just making marks on the paper). This could also be done with any shoe box- just turn it over and cut slits to slip paper in. Collages: I got out stickers, pieces of yarn, tape, crayons, and markers and just let the boys cover sheet after sheet of paper. Play with spices: I got out spices, about 5 at a time, and we smelled them, sitting together in front of the big window watching the rain come down. Both boys loved it. We also used the spice as paint. I added some water to the spice, just enough to make it wet, without watering it down too much, and the boys covered paper with it. Chores: Yes, you read that right! The boys really got into helping me with the laundry (it probably helped that I pulled them around in the basket). While we still had power, they helped me add clothes to the washer and dryer as I snuck in one last load. Later, they helped me match up socks. And we played a game where we raced to see how much laundry we could put into drawers before I counted to 100. They also had fun washing and putting away dishes. Toy Rotation: I mean to be good about toy rotation, I truly do. I have put away some toys, and luckily, I knew where to look with them in the basement, so I could do it by flashlight. I brought them upstairs, and it was like Christmas. The boys had so much fun playing with their “new” old toys. (For my 16 month old, they really were new- I’m bad about toy rotation, which means when I do remember to put away toys to rotate, I forget the rotate part, and they just stay stored in the basement). Legos: I probably should put Legos higher on the list, because they truly were the go-to activity. Whenever one of the other ideas was getting old, we would take a Lego break. Just about every day we play Legos, and days without power were no exception. Legos are a wonderful fine motor activity, and so good for creative thinking, spatial relationships, imagination, math. Playdough: I made a big batch, using this recipe. We used cookie cutters, rolling pins, plastic knives, and mostly our hands to create and play with the dough. Tea parties: I did my best to make snack times extra fun. I got out our teapot, even to just fill with watered down juice. We spread out a blanket and had a picnic on the floor. The boys helped make the snacks. What are your favorite rainy day activities? Do you have a little one? Check out Zero to Two: the book of play, an e-book I co-authored! It includes 25 step-by-step tutorials with pictures, as well as links to over 50 more ways to play with babies and toddlers – all for $8.99. 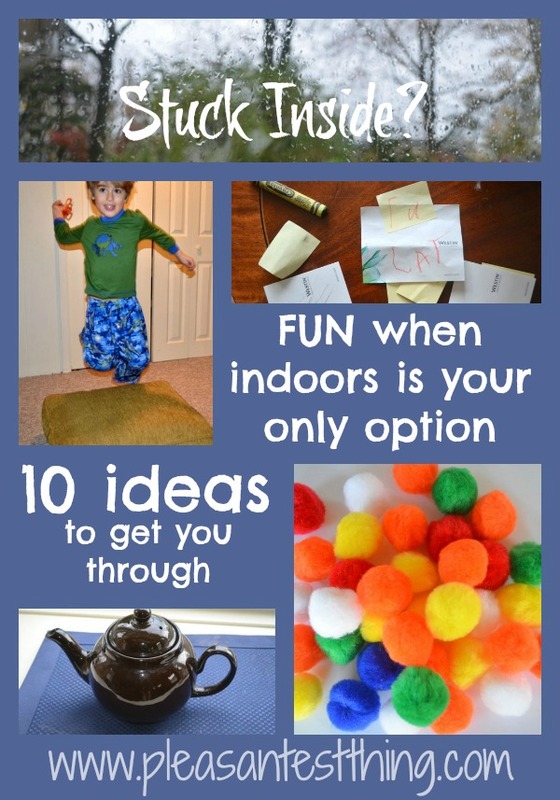 Many of them are great indoor ideas!